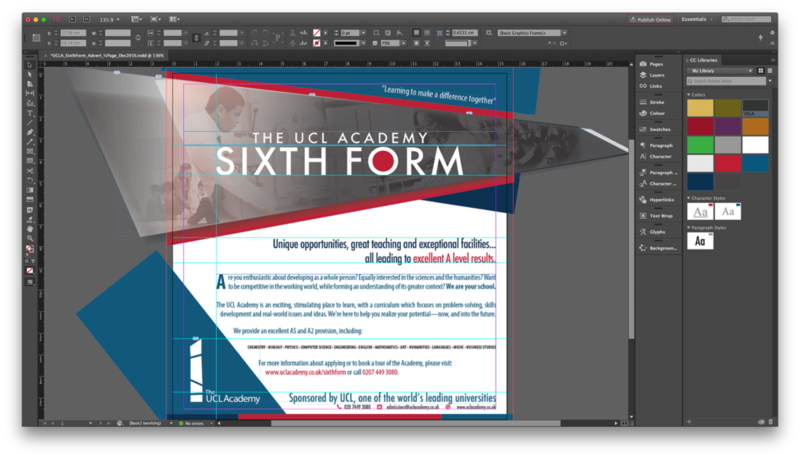 An advertising campaign for The UCL Academy Sixth Form in 2017. I designed a refreshed brand identity for The UCL Academy. With a unique focus on project-based learning, critical cross-disciplinary thinking, and the development of a moral and social conscience, The UCL Academy in Camden needed a way of representing its pedagogy and overall approach to current and prospective students, their parents, and prospective teachers. Beginning with their logo, existing assets, and an existing mission statement, I created a new identity for The UCL Academy based on their mission to deliver "an education for global citizenship". This started with an audit of existing content to determine the key takeaways for students, then moved into a series of surveys and in-person interviews. The "Who We Are" page arose as a introduction to the school, which acted not only to express their core values and educational approach, but also as a hub, connecting incoming visitors to relevant content elsewhere on the website. Once launched, an internal campaign to visit the new page shared amongst staff, students and parents saw a jump in total web traffic of 155% over three months compared to the previous year. People were actively sharing the "Who We Are" page more than any other on the website. Perhaps most importantly, however, there was a noticeable increase in through traffic, suggesting that the presence of a hub increased the website's overall usefulness as a marketing tool. This relatively small content marketing campaign lead to a pivot in how the Academy had been approaching Sixth Form recruitment strategy: senior leadership asked me to use the research (and earlier content audit) I had performed to develop a series of advertisements and promotional content pieces for the 2017/18 year. Combining clean diagonal shapes, consistent and professional palettes, and language from the earlier content marketing campaign, I developed a new visual identity for the Academy's Sixth Form—which they soon requested be translated into the entire Academy. Please see the full set on my Behance portfolio. Process shot. View the full set here.